WRITTEN TYCOON (AUS) (Chestnut 2002-Stud 2007). 2 wins at 2, STC Todman Slipper Trial S., Gr.2. Leading Aust. First Season Sire 2010-11. Sire of 288 rnrs, 195 wnrs, 11 SW, inc. Howmuchdoyouloveme (MRC Caulfield Sprint H., Gr.2), Rich Enuff, Tycoon Tara, Written Dash, Trump, Vibrant Rouge, It is Written, Grand Tycoon, Stoker, Written Up, Danger Close, SP Novel Dancer, Press Report, Andre Roo Hoo, Masthead, Prestigious Miss, Music Magnate, etc. Gracie May (f. by Written Tycoon). 2 wins. See below. Yassa. 5 wins from 1200m to 2100m, A$116,200, VRC Renaissance Sydney Hotel Welter H., Les Benton H., VATC Luther's Luck H., 2d VRC Gold & Black H., MVRC Herald Sun Super Form H., 3d VATC Mainland Cheese P.H., Wheatear H., Anonyme Welter H.
PENNACCHIO (Align). 8 wins from 1200m to 1600m, NZ$89,951, A$112,000, BRC Spear Chief H., L, Qld Tatt's RC Centenary Classic Mile, L, ARC Victoria Racing Club Trophy, Piazza d'Oro H., Pencarrow Stud H., 2d Avondale JC Image Holdings H., Counties RC The Informant H., 3d Egmont RC Postponed Classic, Gr.3. (Mr) Bandit Country. Winner at 1000m, 3d Hawke's Bay Bay Ford Hastings 2YO H.
FRIENDS LAKE (A.P. Indy). 3 wins-2 at 2-from 6½f to 9f, US$696,400, Gulfstream Florida Derby, Gr.1, Belmont Sleepy Hollow S., L, 3d Gulfstream Holy Bull S., Gr.3. Sire. MINERALOGIST (Mineshaft). 5 wins-3 at 2-from 5½f to 9f, US$270,550, Saratoga Dew S., L, Belmont Joseph A Gimma S., L.
AUXILIANTE (Practicante). 20 wins in Italy and Argentina, Milan Premio Vittorio di Capua, Gr.2, San Isidro Clasico Gran Bretana, Gr.3, Palermo Clasico Benito Villanueva, Gr.3, Clasico Bolivia, Gr.3, Clasico Old Man, Gr.3, 2d Premio Roma Vecchia, Gr.3, Palermo Clasico Peru, Gr.3, 3d Rome Premio Presidente della Repubblica, Gr.1, San Isidro Clasico Otono, Gr.2, Premio Roma Vecchia, Gr.3. Sire. AUNANTE (Practicante). 5 wins in Argentina, Brazil and Uruguay, Montevideo JC Clasico Carlos Pellegrini, Gr.2, 2d Cristal G.P. Protetora do Turfe, L, 3d La Plata Clasico Bandera Argentina, L. Sire. STORM MARCOPOLO (Bernstein). Champion sprinter in Argentina in 2007-08. 7 wins at 1000m in Argentina, San Isidro G.P. Estrellas Sprint, Gr.1, Palermo G.P. Internacional Ciudad de Buenos Aires, Gr.1, Clasico Irlanda, Gr.3, Clasico Estados Unidos de America, Gr.3, 2d Palermo Especial Seaborg, Especial Contante, 3d Turfway Holiday Cheer S., L.
Race Record: 14 Starts 2-0-1 A$18,400. 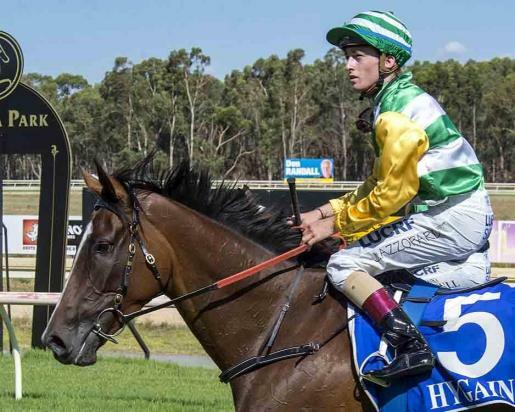 2 wins at 1300m, 2000m to 2014-15, 3d WATC Tabtouch.com.au H.